Apex is a proprietary language developed by Salesforce.com. It is a strongly typed, object-oriented programming language that allows developers to execute flow and transaction control statements on the Force.com platform server in conjunction with calls to the Force.com API. 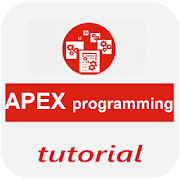 This tutorial is targeted for Salesforce programmers beginning to learn Apex. This will bring you to an Intermediate level of expertise in Apex programming covering all the important aspects of Apex with complete hands-on code experience. Basic knowledge of Salesforce platform and development is needed. Apex is a programming language which has to be used with Salesforce. This tutorial assumes that you already have set up the Salesforce instance which will be used to do our Apex programming.